Ideal for acrylic or oil works, Soluvar varnishes are solvent based, durable, and non-yellowing. They reduce surface "tack," pressure sensitivity, and static electrical buildup. They dry to a clear, water-resistant surface that protects the painting from dust and dirt. Soluvar varnishes also provide a measure of UV protection, by diffusing ultraviolet radiation before it contacts the painting. A thicker varnish film provides greater protection. Soluvar varnishes are flexible, and will not craze or crack with changes in humidity and temperature. Mix matte and gloss varnishes together to achieve a range of matte or gloss effects. 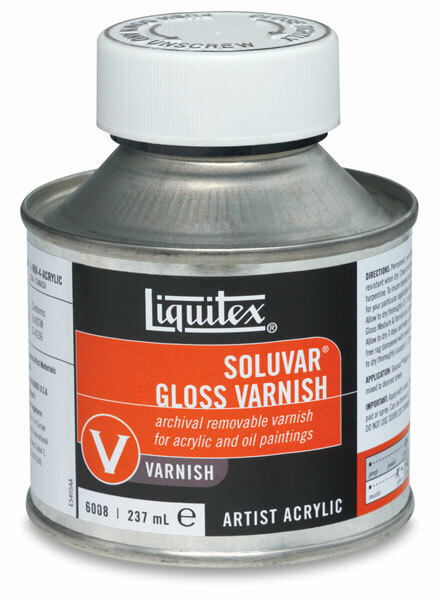 Liquitex Gloss Medium and Varnish is recommended to be used as an isolation barrier, which acts as permanent protection for the painting prior to the application of Soluvar varnish. ® Liquitex is a registered trademark.® Soluvar is a registered trademark. Why varnish an acrylic painting? This video explains the importance of varnishing acrylic paintings as well as oil. We will also show you the wide variety of varnishes Liquitex offers so you can select the right one to protect your work. Varnishing is a very important step in painting. This video will not only talk about why you should varnish, but we'll show you the best method of applying varnish to your painting to ensure great results.